Kevin Murray Associates led the stakeholder and community engagement for the Former Cockenzie Power Station Masterplan as part of the masterplan team led by Peter Brett Associates, with Duncan Whatmore Urban Design & Architecture, Energised Environments and Gardiner Theobald. 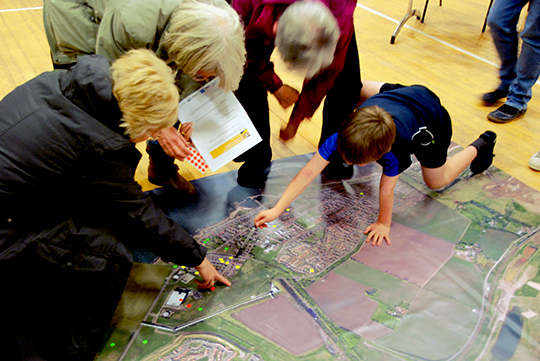 East Lothian Council had identified that community and stakeholder buy-in would be key to the masterplan, so KMA designed a process that would be central to the masterplan, built around two stages of public consultation, the first one during November 2016 and the second during February 2017. The engagement process consisted of workshops with National Agencies and Local Stakeholders, drop-in community sessions in Prestonpans, Cockenzie and Port Seton and unstaffed drop-in sessions in local libraries in Longniddry, Prestonpans and Port Seton. We also ran school workshops at Preston Lodge High School during both stages and at Longniddry Primary School during the second stage. Across this programme of engagement there were multiple methods by which participants could feed in their thoughts and ideas. 506 people participated in the process from residents, young families, civic and heritage groups, community representatives, to developers and East Lothian Council officers. During discussion and feedback from the first stage, ideas and aspirations for the site emerged focussed around future leisure uses, retail use, specialist housing, employment and industry, energy, community uses, tourism and heritage, transport, infrastructure and connectivity, landscape, biodiversity and education. Those involved collectively sought to raise the aspiration of the area through the creation of a destination. The vision for this destination was clean, with connecting green areas; respectful of the heritage and natural assets of the site and to create an environment where people want to work, stay and live. The material from this first stage was used to develop a set of principles that aided the design team in producing several scenarios for the site. These scenarios were illustrative of how different approaches to the site, driven by the principles, produced different outcomes. We presented these to stakeholders and community in a second round of workshops, drop-in sessions and community presentations. 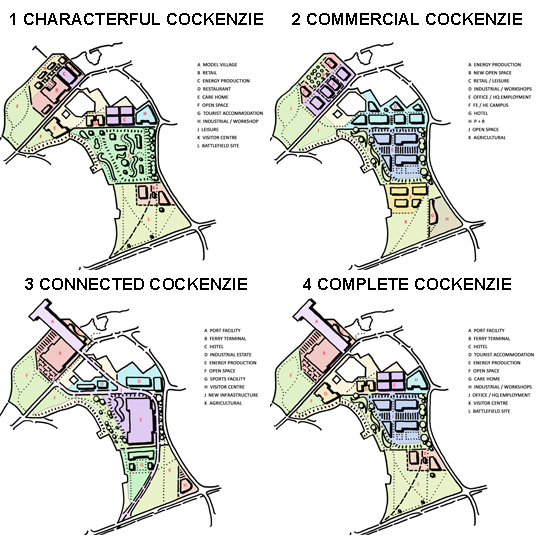 The first scenario “Characterful Cockenzie” was community oriented, the second “Commercial Cockenzie” was commercially driven, the third “Connected Cockenzie” was infrastructure driven and a fourth hybrid scenario was shown to demonstrate another way of looking at the site. During this stage, we asked people to evaluate these scenarios against the principles, and then to suggest their own hybrid. •	Zone 1 (by the coast) mostly for leisure and recreation use. •	Zone 2 and 3 (the transformer station and coal store sites) for employment, energy and education uses. •	Zone 4 (agricultural land and the battlefield site) preserved as open space and heritage uses. Across the site, people wanted a strong green network to be used to connect the site and make it highly accessible, to add more green space and not to over develop the site. Some of the tension that has been present from the first stage around the viability and the positive or negative impact of a cruise terminal was still present, although it was by this stage apparent that the technical and economic feasibility of such a port was low. For the youth, the need for leisure and recreational activities was expressed. Several attendees talked about the importance of arts in the area and how this can become a driver of local regeneration. The consultation analysis and report will be used as a basis for producing the masterplan alongside the technical baseline material. The masterplan report can be viewed here.